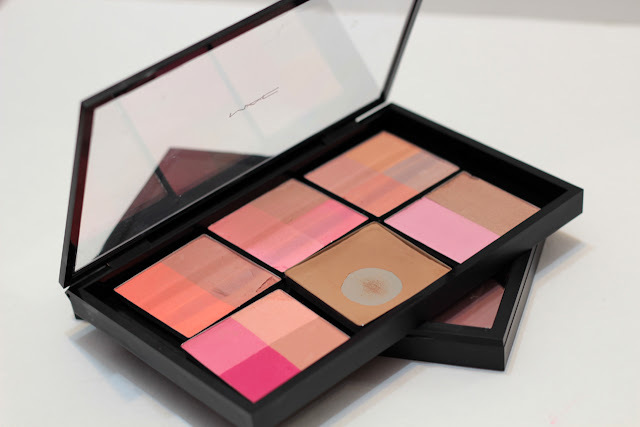 Ever since these new MAC pro palettes were released, I have been obsessed, so I'm going to give today's winner two of these large MAC pro palettes so you can place your depotted blushes / eyeshadows in them! As you can see, I use mine for an assortment of blushes, not just MAC ones. I have depotted Hard Candy blushes, my Benefit Hoola, a couple MAC blushes, and a Physician's Formula blush. 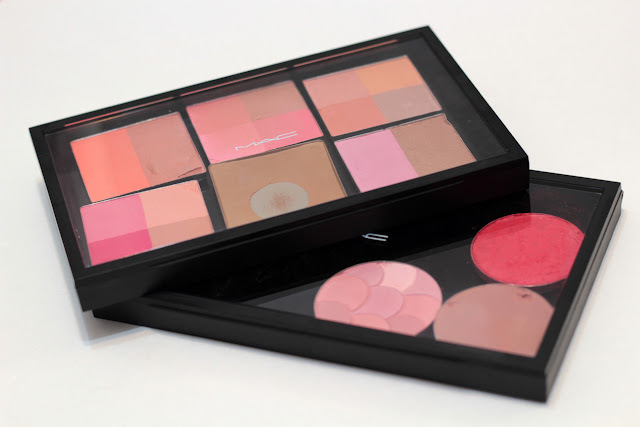 I like these palettes because they're in the same price range as the Z Palette, but made of a sturdier material (i.e. plastic). I also love the clear tops because it allows you to actually see what's inside the palette. They're magnetized, but only certain magnetized pans will stick to them. In all other cases, you'll have to stick a magnet to the bottom of the pans for them to stick. With these pro palettes, you also have a choice of purchasing inserts. I have zero desire to pick one up. They're impractical for me since I don't have a whole bunch of MAC eyeshadows or blushes. The customize inserts (i.e., the one with wells) looks interesting, though. If you're looking to depot a bunch of cream products, like foundations or lipsticks, it would be great for you. Other than that, I think it's a pricey addition considering the palettes work so well without inserts. However, if the winner would like to try one out, I'd be more than happy to pick one up to include as a prize. If you'd like to win two empty MAC pro palettes, just enter below. 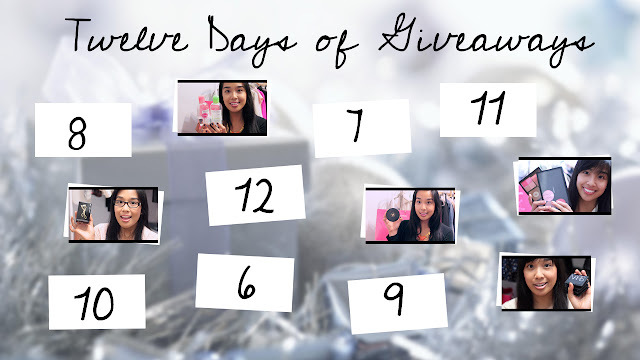 All you need to know is that this giveaway is open worldwide and it will end on December 8th, 2012 at 12:00 AM EST. The winner will be contacted via email. Plus, I will announce the winner here and on facebook / twitter. Love depotting my makeup! I never have enough room for everything in the original packaging. I have never done it before but would love to try! I haven't really tried depotting any of my makeup but it would definitely be a space saver! Yes, since it saves me alot of space! I've never depotted any of my makeup, but I'd love to if I had a palette. That would free up so much room in my drawer! Yes I do. About 95% of my eyeshadow and blushes are depotted. It's very practical. I love depotting﻿ my shadows or blushes and putting them in magnetic palettes. It's so much more convenient! I'm a huge fan of depotting since I travel so much, it saves me a lot of space in my luggage when I'm bringing a lot of makeup! YES I DO! it saves a lot of space! I've actually never tried depotting, I might soon though! I'd love to win this palette ! I've never depotted anything because I was looking for a good palette! I have a few mac palettes that I would like to depot...but never found the opportunity to! I've never tried depotting before... I'm not sure if it's something I would like, though. I don't personally depot since I don't have a﻿ TON of eyeshadows, but I like the idea of it! I've actually never depotted my makeup before, but I love the idea of it! i always depot my makeup to make it easier and handy. i would kove that pro palette by mac! I have been starting to collect mac and nyx shadows and don't have a palette yet so I can't depot them yet, I'd love to get the chance to though. I have never tried to depot my makeup but I would like to! I love the see through lid of the new MAC palette! I've never depotted my makeup, but I can see how convenient this would be!! I have never deported but I would love to try. Would be a great space saver! I have never depotted my makeup but would love to try. Thanks for the giveaway! I've never tried depotting any of my makeup items but I've been wanting these new MAC palettes since they came out. It will help to save space in my makeup drawer. Thank you for this great giveaway! i've actually never tried depotting but would love to try it. I've depotted several drugstore eyeshadows and put it in my Unii palette. I would be interested to try this one out. yes i love depotting my mac eyeshadows! i don't have any of the new style palettes though. i've never done it but i think it would be great for travel! I've always wanted to de-pot my makeup but never had the chance to! I have never tried to depot anything before, but I've watched videos on how to do it and it seems pretty easy. Yes. Its easier that way. Have everything you like in one palette. Easy to travel with. I'm terrible at depotting, but I do think that it's more convenient. I end up gouging chunks out of my makeup, though! I do like deporting but hate when I break or,crack the product. I've tried depotting some products before, it's great for carrying in your handbag or travelling. I love the magnetic back on this palette! i never really had a lot of makeup.. but i would if i had some! I've never done it but I have a few products that would benefit from it! I've never done it but I would probably do it one day. I've never depotted makeup before but I was actually planning on buying a z or a mac palette after christmas to start doing so because having a bunch of small random palettes is annoying and I'd rather have them in one place. I really want to try these palettes without the inserts! I've never depotted anything before. I'd love to depot my shadows coz i usually buy palettes but not single one!thx for the giveaway! The new palettes look really nice! i haven't depotted my eyeshadows in very long time because i'm afraid to damage the pot itself (knowing my luck). I've never tried depotting because I'm afraid of damaging the products! I've never depotted, but would love to try! i've just recently gotten into depotting my makeup, ordered the z palette not too long ago but I can tell that this isn't an item that will last long, love that the new mac palettes have see through lids! I want to start depotting my makeup but I don't have anything to put the depotted makeup into! i have some eyeshadows i would love to depot, but have never tried! I love depotting my makeup but the process can be a pain! I never had a palette before so I never﻿ depotted my makeup..
No. I like it in the containers they come in.